Having healthy hair needs some care and attention. Along with having healthy hair, if you want to focus on growing your hair also, then the task becomes harder. You need to give a lot of care, energy and effort for having healthy hair that grows well. By using some of the ingredients that are natural, you can speed up the growth of your hair and also keep your hair healthy. Yogurt is an effective hair care ingredient that you can use. It is a rich source of vitamins and fatty acids needed for your hair. The antifungal properties of yogurt help in soothing the scalp and getting rid of dandruff. It can keep your hair moisturized for a long time and thus prevent frizzy hair. It is very effective for controlling hair fall. This is because it improves the heath of scalp and has the ability to reduce clogging of follicles. By regulating the sebum production, it helps in balancing the pH levels of your scalp. The cooling effect of yogurt helps in soothing aggravated scalp. Take all the ingredients in a bowl and combine well to get a smooth paste. Massage your scalp with this mixture for about 15 minutes. Now cover your hair from the roots to the tips and leave it on your hair for 30 minutes. Applying this mask on your hair twice a week helps in keeping your hair healthy as aloe vera is rich in proteins and amino acids. It also has anti microbial properties. Mash avocadoes and add the rest of the ingredients to it to get a smooth paste. Apply it on your hair, taking care to cover our entire hair. Leave it on your hair for 20 minutes and then wash your hair with shampoo. Apply this once every week. Avocado is good for repairing the scalp and making your hair grow fast because it is rich in Vitamin E and antioxidants. It is also a good conditioner. Take the banana in a bowl and mash it till no lumps are there. Add the other ingredients to this mashed banana and mix well to get a fine paste. Apply this mixture on your hair from roots to tips and make sure that it covers all your hair. Wait for 25 to 30 minutes and then wash off with shampoo. You can apply this mask on your hair twice a week. This mask keeps your hair and scalp well hydrated. It is also very nutritious and has the ability to cleanse your scalp. Wash he curry leaves and make a paste out of them. Add 1 cup of yogurt to it and mix well. Leave it for 30 minutes and then wash it off with shampoo. Mix the ingredients in a bowl and massage your scalp with it. Wait for 2 hours and then wash it off with lukewarm water. You can also add fenugreek or lemon juice o yogurt and apply on your hair. So, try these hair masks at home and have healthy hair that grows fast. Whisk the egg in a bowl till the yellow and white of the egg are mixed well. Add yogurt to this runny egg and mix well to get a paste. Now you have to section your hair and apply the mixture from the roots to the tips of hair. Take care to cover all of your hair with this mask and then wait for 20 to 30 minutes. Rinse your hair with shampoo and cool water. Apply this mask twice a week. Egg, rich in proteins helps in nourishing your hair. So, your hair grows fast. Take a bowl and mix yogurt and olive oil in it. Now add water and lemon juice to it. Wash your hair with shampoo and squeeze to remove extra water from your hair. Apply this mask well on your hair and wait for about 20 minutes. You can follow this by rinsing your hair with lemon water. Repeat the process twice a week to grow your hair fast. This hair mask conditions your hair and makes your hair more manageable. Lemon rinse helps in maintaining the pH balance of your hair and makes your hair shinier. Take all the ingredients in a bowl and mix well to get a smooth and consistent paste. Apply this on your hair and make sure that all your hair is covered well. Leave it on your hair for 30 minutes and then rinse with mild shampoo. You can apply this mask on your hair twice a week. This hair mask is great for controlling the production of oil in your scalp and therefore is good for preventing follicles from getting clogged. If you have dry hair, you can add banana to this mask. 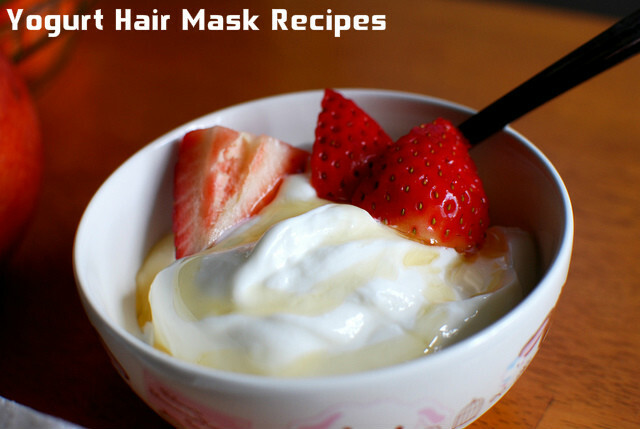 If your hair is greasy, add strawberries to this mask.